I found this recipe a few days ago over on The Pioneer Woman's blog. It immediately caught my eye, because she literally served this in mini Frito bags. What in the world? Then, that night, I saw a show on Food Network that did the exact same thing. For something I had never seen before, to seeing it twice in the same day, I guess I had to try it. The only problem was, that I would have to buy a big box of variety chips in order to get the small Frito bags and I didn't want to do that and there wasn't a vending machine around to buy two bags from. So, I didn't get to try the fun way of serving this and went with the boring way of just eating it a regular old bowl. This was really really yummy. 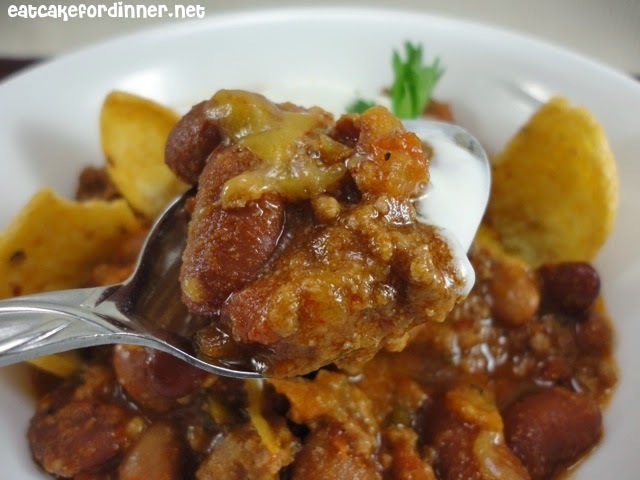 What better way to welcome October, than with a warm comforting bowl of chili. 1/2 onion, finely chopped, opt. 1/2 green pepper, finely chopped, opt. Ohh this looks so good! Found you from the Something Swanky Blog Hop. I'm your newest follower. What a fun dinner idea! I looked at the pioneer women's website and the frito bag idea is sooo great. I think my kids would get such a kick out of this. I know I saw a 6 pack of the small frito bags in my market the other day. Thank you so much for the idea. When I post it on my blog I will link back to you and of course the pioneer woman. We call this Chili-in-a-Bag where I come from. You can't go to a festival or fair without seeing some one walking around with one! We call it a walking taco !! My family makes this but with taco meat! Ha, not quite as fancy as pioneer woman. So delicious. Sorry I haven't commented in so long! I have kind of fallen off the blogosphere this summer but, I still have been following and still love your recipes and will be a more devoted follower starting now! I tried this right after she posted it and it was so yummy. 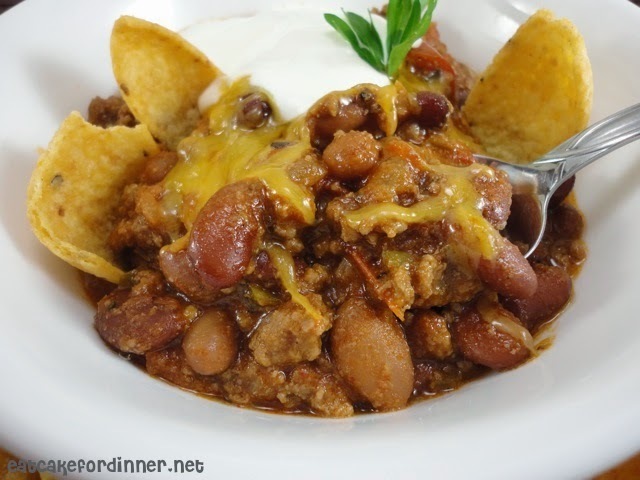 I still remember at my grade school fair one year that they served chili (probably Hormel) and shredded cheese over Fritos in the small bag. I loved it back then but have never made it. I think it's about time, since it's been about 40 years. WOW!! You can't go to a single football game here and not have frito chili pie in the bag served at concessions...they also did it with Nachos and "walking tacos" it was hot comforting and portable for sports events! I remember my father serving it to my sister and I when we were young as well...it has been a staple during the winter months for years in our home. Thanks for the recipe! I was looking for something to use up some beans I have. Must not have Sonic Drive In's there. This has been on their menu since I can remember & my favorite to get. Although it's can chilli & american cheese. They are even serving as a wrap now. Although I have been eating this since childhood I have never seen it eaten out of the bag, what a neat idea! Cant wait to try this homemade version which sounds so much better. This looks amazing, thanks for the idea. I want to turn this into a Freezer meal.... (without the fritos of course) Thanks so much! I am eating some of this right now. So yummy. Around here we call them Frito boats (CA).